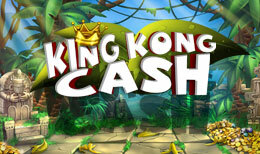 Go bananas with King Kong and friends with this 5 reel slot that’s packed full of kooky and fun lines as you venture through Skull Island in search of Kong’s treasure. On each spin there’s always the chance that Kong will awaken and gift you with a surprise bonus win. a very big part of the online gaming industry. the experience if we don't mind saying. Enjoy fun slots that don't take themselves too seriously? This is most definitely the game for you. convey has mostly been a success if you don't mind lots of colour based on a set theme. order to get more bang for your buck.